Complete 4G roaming is very much on the cards, says says Qualcomm's Roberto di Pietro. 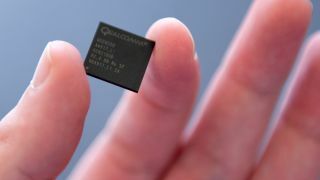 Qualcomm has just announced the RF360 - a single chip that provides access to over 40 mobile bands globally. 4G LTE is provided on many frequency bands in different countries and it's this variation that's made the RF360 necessary. It's good news for handsets manufacturers who have to develop different handsets for different markets. Even the iPhone 5 has three different versions globally - two different GSM models that work on different LTE bands and then one CDMA model. di Pietro says it won't take long for the technology to be adopted, and believes it's "another step toward the democratisation of LTE", as the technology moves towards mass adoption. "This year we'll have devices from the high tier to the low tier with multi-mode LTE, HSPA+, 3G and GSM in a single chip. You can imagine how tough this has been for our engineering team to put this on a single piece of silicon. We've got got more or less 40 bands on this chip. It's kind of a multi-dimensional complexity." We also quizzed di Pietro about the advances made in terms of battery life - and consumer demand for bigger screens yet with longer standby times. "Everything is built with the assumption we need to optimise power consumption - and not just the architecture as a whole, but every single core. We are delivering. Even in terms of performance the Snapdragon 600 and 800 are moving from 30-40 per cent battery performance improvements to 70 percent with the 800." "The efficiency of this architecture is the crucial element for performance. We're optimising the usage of each core depending on [what it's being used for]. "When we design our chipsets we design from the ground up, bearing in mind that we need to have the performance but at the right power consumption. Most of our competitors are moving to the mobile industry from other industries so they are moving from the top down - kind of reverse engineering. So this really helps us have a competitive advantage." Are people wrong to simply look for more cores inside their smartphones? "What is inside of these devices matters more and more for the end user and the number of cores is an easy message for consumers to understand. "From our perspective it's crucial to pass on the message about the user experience. It's a challenge because it's much easier to say numbers than trying to [communicate] the main elements that makes the experience around Snapdragon better." "It's the difference between us and our competitors. We have a broad and deep offer. We are present in the ultra-high tier and now lower, we've launched the Snapdragon 400 and 200. We're taking the top experience of maybe six months ago and bringing it to an affordable price point. 400 is really the cutting edge for that price tier. Also the 200 has quad-core on the [ARM Cortex] A5 architecture. We really want to enable the best user experience in all the tiers. di Pietro, who was a senior figure at 3 when it launched 3G in the UK, also believes Qualcomm's expertise in LTE chips will keep it ahead. "We're already on our third-generation. While the others - where are they? Of course they are coming. And thank God they're coming - competition is always good. But we have one and a half, two years advantage. While the others are coming to the market, we have time to innovate. "The capability we have to invest in R&D and innovation is one of our key assets. We invested more than $3 billion last year, it's a massive amount. It's helping the industry move to a new mobile era. We're not just part of this platform, we're building this platform."